Commencement on the Syracuse University Hill takes on a different meaning for each participant. All of our grads have a great story to tell, and many of them will be telling it through the use of social media. The challenge then becomes how to experience the rich content of tweets and pictures that make up a mosaic of Commencement coverage? We think we have one such way. Through the use of social media curating tool Rebel Mouse, we’ll be pulling together social media posts that tell the story of Convocation and Commencement related activities. If you plan to attend, use the hashtag “#SUGrad13” and your pictures and tweets may get posted to our Rebel Mouse page. 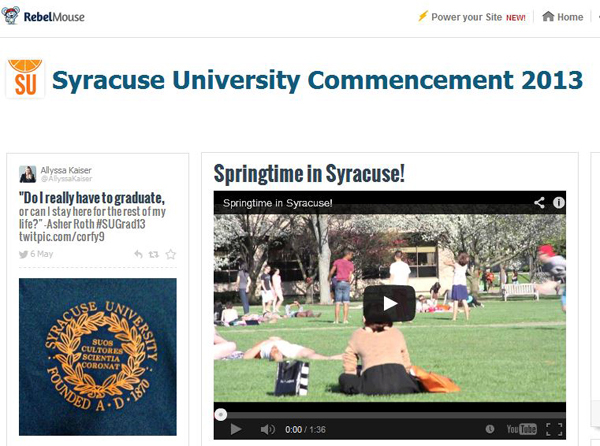 If you’d like to see how it all comes together, you’ll be able to view our coverage at www.syr.edu. You can also view the Rebel Mouse page at www.rebelmouse.com/SUGrad13/.